Thomas Golf custom made long putters have become increasingly popular with both amateurs and pros over the last few years. The long putting style is helpful for golfers who have back pain when they bend over a traditional putter. 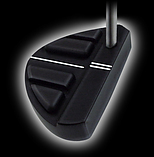 The long putter delivers more of a desirable pendulum motion to your stroke, due to its length. Some golfers find it harder to determine the strength of the putt, however, using the long putter style makes it impossible to break down the wrists during the stroke. Below are some of the putter models that Thomas Golf offers in the long putter style. The key to Thomas Golf's superior long putters is the weighted hosel adapter that converts the lie of the club to be more upright, and the hosel weight that also increases the putters MOI. The added weight and offset of our hosel are crucial to the perfomance and feel of our long putter heads. The AT 72 putter has an extended mallet design which offers a slightly heavier feel for golfers who prefer a more weighted putter head. The putter face features a high grade CNC milled red aluminum striking plate insert for superior feel. The silver weight arc is heavier than the rest of the putter material, shifting the weight placement to the back perimeter of the putter head for a high moment of inertia, creating even more forgiveness and truer roll. The AT 91 mallet putter is similar in appearances to the AT 72, but drastically different in performance and feel. With the AT 91, Thomas Golf has achieved the highest level of moment of inertia for a putter by combining our extra-light aluminum body with the heavily weighted bars placed to the far perimeter of the toe and heel. These are the first ever weight bars with flat tops and sides to help improve alignment of the putt. The AT 91 is center-shafted, providing greater stability during the putting stroke. The AT 71 mallet putter features fixed-position weight ports that create a moment of inertia by reducing club head twisting. A wide alignment channel passes across the putter from the face to the back, giving 3-dimensional visualization of direction. Splitting the top surface of the putter into two separate elevations ensures the golfer's eyes are directly over the ball. If the golfers eyes drift to the outside or inside of the ball, the bi-level alignment indicators will immediately let the golfer know. 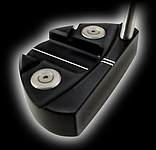 The AT 60u is our more compact head mallet putter that still provides a solid feel. The unique linear bi-level design on the AT 60u allows for easier ball framing, resulting in more accurate and consistent putts. The AT 60u is separated by two different elevations, which help you place your eyes directly over the golf ball. If you alignment is off, you'll be able to tell by the black and gold alignment indicators. Choosing to change your putting style radically can be a big decision. At Thomas Golf, we offer a 30 day satisfaction guarantee, in case you decide that you do not like the long putter style. Most left-handed golfers have trouble finding the equipment to best suit their swing. Thomas Golf offers many choices, when it comes to putting, for the left-handed golfer. For golfers who prefer the long putter style, we offer AT 70, AT 71, AT 72, AT 91. There is no reason that you should adjust your game, because you swing left-handed. Check out Thomas Golf's wide variety of left-handed to take your putting game to the next level. As with all of Thomas Golf equipment, our left-handed putters are fully customizable to your body and swing type.